Old Forester was created by George Gavin Brown in 1870. He employed a technique that is fairly common these days — but was rare back then — of combining Whiskey lots from different batches and distilleries to craft a more consistent flavor. 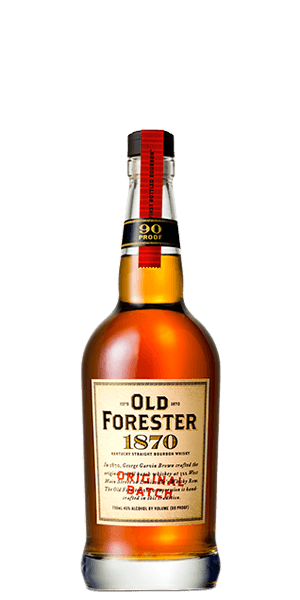 Old Forester 1870 Original Batch Bourbon follows that formula by blending barrels from different batches and warehouses in the Old Forest inventory. Again, the object is to create a consistent flavor profile. And the judges agree — it received a rare Double Gold medal at the SFWSC in 2015 and high points ranking at the international competitions. What does Old Forester 1870 Original Batch taste like? The Flavor Spiral™ shows the most common flavors that you'll taste in Old Forester 1870 Original Batch and gives you a chance to have a taste of it before actually tasting it. Pumpkin spice, biscuits and orange zest. Soft with a light spice. Easy drinker with lots of flavor. Love this as a traditional drinker. Good on the rocks with a splash of water or club. Perfectly drinkable and entirely inoffensive. Nose offers pretty standard bourbon notes, mainly vanilla and oak. Mouthfeel is just slightly creamy, pretty nice actually. Caramel sweetness and a mild spice, then the medium finish drys out, sheds the sweetness, left with mostly oak. Needs no water or ice, remarkably easy to drink neat, almost no heat. No regrets on the purchase / not sure I'll immediately replace it when gone either. So yeah, a solid 6. I LOVE THE 1920 PROHIBITION, BUT THIS IS A GOOD BOTTLE AS WELL. JUST AN EASIER DRINKER. Smooth and spicy. Tried it at a local restaurant. Could have been a different old forester. Will update when possible. My favorite of the Old Forester lineup. Smooth, full-bodied, sweet but not cloying and just a bit spicy. The lower proof burns less than the 1920 (though I do love that one too), making this the best of the line-up for me for sipping neat. Enjoyable but better on ice. Initial flavorss of spice and oak with a mildly biting finish. 1870 is the lowest proof in the Prohibition Row series, but it's a really solid bourbon on it's own. The flavor profile is a tad on the sweet side with tons of caramel, candy corn and a hint of spice. 90 proof makes it on the smooth side, but I really enjoyed this one. Decent sipping bourbon, but seems better suited for mixing. Light on the nose. First time trying this and very smooth. Nice clean taste and finish. Most try it neat is the only way to go.